Did you know that heart disease claims the lives of one in four Americans? Heart disease is the leading cause of death for both men and women. The good news is that one-fourth of all heart disease deaths are preventable and you can take proactive steps toward a healthy heart. 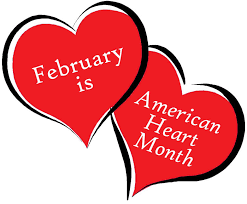 The Centers for Disease Control and Prevention (CDC) and the American Heart Association (AHA) are striving to bring awareness by establishing February as American Heart Month. According to the CDC and AHA, there are some practical steps you can take to ensure lasting heart health and reduce your risk for stroke or heart attack. These things include: Quitting smoking, getting a checkup, knowing your family history, reduce stressors and getting active with your favorite aerobic exercise (swimming, walking, cycling, jogging) for about an hour and a half over the course of a week. And if you’re super busy, you may also forgo the elevator, park farther away and take paths of a little more resistance! You can learn more at www.heart.org. And, of course, we can’t stress enough how crucial it is to make healthy food choices. Healthy food choices can decrease your risk of heart disease and stroke. Choose foods low in saturated fat, trans fat and sodium. Make sure you eat plenty of fruits and vegetables, fiber-rich whole grains, fish, nuts, legumes and seeds. And consider mixing in proteins that don’t include meat, most notably, red meat. As far as dairy goes, choose lower fat.